Most of the companies follow a certain type of human resource system and currently the discussion is about the centralized HR system. The centralized HR system is a process wherein which decision making authority is provided by the management of the company. Which mean other than the decentralization human resource the centralized process takes responsibility of each and every department of the company, whether it is the low level department or the higher level department, centralized organizational structure is decision-making structure where all authority is only processed by the management of the company. Most commonly the working procedure and the environment of the company takes place by their head of the company, similarly in the centralized human resource system all the activities of the company and the department will be handled by the owners of the company and the management. Moreover, this discussion is all about the benefits of centralized human resource system. As the working procedure of the centralized human resource handles each and every department of the company. Therefore, it is very much clear to communicate with the rest of the department of the company. If the company management need to take certain decision for the welfare and growth of the company, then the company management needs to communicate with all then low level to the high level department of the company. And the only difference is that unlike decentralization the management doesn’t consider any opinions from those department heads. It is commonly understood and explained that the activities of the human resource management system takes all the payroll and employee related queries. And because of that the company can send their human resource representative to various places to handle their company’s finances and employee issues. Therefore, because of this the company earns a better profit and starts obtaining cost savings for the overall development of the company. As the nature of centralized human resource system is concerned, it handles all sorts of company emergency without any additional effort. And that is possible with the help of advance training. The centralized human resource system operates some sort of training arrangement for all the employees of the company. In those training sessions the employees are trained according to the needs of the knowledge which can company require in future times. With the help of the centralized human resource functions, it is necessary to understand all the facts of knowledge sharing aspects between the employees and the employers. The term of knowledge sharing can be processed in the form of the job description. In the job description the human resource manager provides all the detailed information about the responsibility or the duties of the work profile. Therefore, during the process of job description the employee will be detailed with all necessary knowledge required to complete the task assigned. In the centralized human resource system the activities of the company will be assigned to a different group of people or a team. But the accessibility of the human resource department will be provided only to the line managers and the senior manager. That is why the centralized human resource system provides better concentration so that they increase the quality of their work. It is necessary to understand that the centralized HR maintains a better concentration level. When a company decides to follow the centralized human resource system, then the company and its employees need to bring out their activities as per the regulations of the centralized HR functions. And one of the main benefits that the employees of the company entertained with is that the employees of the company can expect the support of the higher management for the overall goodness of their personal and professional career. As a matter of discussion all the advantages of centralized human resource management can be turned the demerits of centralization Recruitment Process. Therefore, to proceed further with this a person need to understand all the key factors of cons in relation with the pros of the centralized HR. As it has been explained earlier that the centralized human resource systems helped to reduce operating costs with its own centralized activities. But it is only feasible and applicable to the large scale business. On the other hand the company which has been established with lower investment and capital can not reduce the operating cost with the help of the centralized human resource systems. Therefore, cost saving can be beneficial for successful large companies. It is possible when the company makes decisions like hiring employees for the company, but the actual problem occurs when the candidate appears the job. When the employer hires a person for the job, then he or she expects certain skills and talents from the candidate, but later on those skills and talents of the employee or the candidate keeps vanishing and that is when the employees produce difference of opinion. In this matter the manager estrange can be explained as a ignoring or unfriendly behavior towards the staff and the departmental heads. It is possible that because of the centralized human resource system the manager might feel a bit ignored by the rest of the employees of the company, but the actual truth is that the manager of the department will be separated from the team because he or she is expected to lead the team separately. 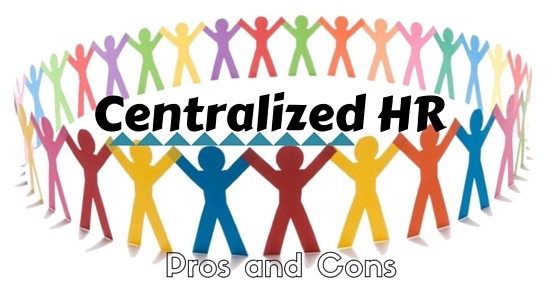 And the bottom line at the end of the discussion over pros and cons of centralized human resource functions is that, centralized HR functions provide benefits as well as disadvantages. But things can be more informative when the company follows the centralized HR system instead of the decentralized HR system. Therefore, if any interested people need and want to know more about the centralized human resource management, then they can follow all the above mentioned aspects along with its pros and cons of centralization.